← Beaches, Shells and Fishing. Heading south was going to get a lot cooler for us after the temperatures being mostly mid to high thirties for most of our trip but we were looking forward to seeing some old friends and making some new ones. Day 1, 01/07, was mostly spent in the car. We pulled into Sandfire Roadhouse for diesel and to make some lunch. Never before had we seen such a line up for fuel, waiting time was about half an hour. Lunch with the peacocks around was interesting as one in particular took a liking to me and what I was eating, trying to get to the saos in my hand and stalking me around the trailer. Our stopover for the night was on the De Grey River at a rest stop which was right beside the river and it was very peaceful. Our neighbours were from a cattle station near Binnu and were lovely people, Ian and Kay (not our previous friends, just a coincidence), they invited us to join them by their fire that evening which we did and it was good to hear of their adventures for ideas on places to visit. The next day we headed to Port Hedland, as the weather wasn’t the best we didn’t do a lot of sightseeing on the way but we did enjoy the drive. First stop was in South Hedland to stock up on supplies then back to Port Hedland for some sightseeing around the Port and Salt lakes. Freight liners were huge down at the Port, as we enjoyed our lunch there we saw a couple come in which was amazing to see. It was here we met Charlie and Mick who invited themselves to a seat with Murray while I got lunch ready at the trailer. When I returned with the lunch Mick says, “That’s what we need, Charlie!” “What’s that?” says Charlie. “A wife, then we’d have some lunch too!” laughs Mick. They both sit there having a great old laugh and then continue to chat. I laugh at them when they head for the car as neither of them looks like they’re real healthy or agile enough for driving the car they’re in. Funny old chaps they were. Whim Creek Hotel was where we decided to spend the evening and set up camp in the car park. It doesn’t cost anything to camp or shower here as long as you patronise the bar/restaurant. There were quite a few staying here including the ‘Ride to the Other Side’ charity team who have been driving a ride on mower around the country over the past couple of years. There was even a band setting up for the evening…it was now we find out it is the beginning of NAIDOC week and the band weren’t the only indigenous we would see that night. Well, this was certainly an entertaining evening with car loads of people from outlying communities arriving, plenty of alcohol being consumed by most of them and some very intriguing characters among them. Our dinner was lovely with our neighbours joining us, Elaine and George from Mildura, but as our trailer isn’t something you can lock the doors on we headed back early to look after things. Just as well we did as some young girls with the families inside decided they might take a look around the vans in the car park but didn’t expect to find us sitting outside ours having a cuppa in the dark and when they approached they got a scare. Haha, we caught them out. Nobody bothered us throughout the night, even though there was a bit of an argument in the early hours of the morning but nothing that wasn’t stopped without a fight. The next morning we headed to Karratha in search of some touristy things to see and do. At the information centre the staff were fantastic, very informative and made us feel guilty that we weren’t staying in town for the night but we wanted to see Dampier as well that day and had plans to free camp somewhere. We filled up our water tank on the trailer and set off for Dampier. The weather wasn’t looking too favourable but it did hold off while we did some sightseeing. This place reminded me of something Hawaiian with the palms along the sandy waterfront and the colour of the water. After a drive around the Dampier port and beaches we had our lunch at a park opposite the Red Dog memorial. I love that movie. Sturt’s Desert Pea was growing beautifully here and is an unusual but pretty flower. Dampier is home to the North West Shelf Project, one of Australia’s largest resource developments and the world’s biggest producers of gas. This plant was amazing, it was a shame we were there on a day it was closed to the public because we would have loved to do a tour but we managed to take some great photos. Robe River was our place of rest for the night and as we set up it began to spit with rain but we managed to get dinner in without getting wet as we enjoyed sharing a shelter with some other people who had stopped here for the night. It was here we cooked up our station sausages from Barn Hill and they were beautiful. Then the heavens opened and didn’t let up much throughout the night. We had a very wet pack up the next morning and moved on as some of the roads behind us were beginning to be closed. Our trip south was supposed to take us about two weeks. The plans were to visit Ningaloo, Shark Bay and Monkey Mia before arriving in Perth around the 11th July but the weather was beginning to get a bit monotonous with rain, rain and more rain predicted everywhere we went or wanted to go. After our wet pack up at Robe River we headed to Carnarvon where the weather was fine by the time we got there but the midgies and mozzies weren’t too friendly, even Murray was affected by the midgies this time. Luck was on our side though and we had a very good indoor camp kitchen which we made use of to eat our dinner in over the two nights we were there. We did do some touristy things such as visiting the 1 mile jetty, Chinaman’s pool and the Space Museum which we could also see from the caravan park at night. This station was part of integral communications for the first landing on the moon but it was never widely known or publicised like the Parkes telescope. We also had our flu shots while in town at a chemist, where they were very friend and only too happy to assist us. The caretakers of our caravan park, The Capricorn, were helpful and friendly, they liked to treat their patrons with something different in themed evenings and we were happy to join in their curry night for $15 each with three different curries, rice and pappadums. A great evening where we sat with the caretakers Mal and Michelle plus their helpers that night Doug and Margy. Once again we had plenty of laughs, heard lots of stories and the food was excellent. Fresh veges were supplied each morning by a local farmer and for sale at the front office. Rain and bad weather persisted while we were here which made it hard to want to move on due to wet pack ups but we were now pushing ourselves to get to Perth and the comfort of Jeff and Sharyn’s home. The weather followed us all the way to our next overnight stop which was at Galena Bridge Rest Area where the birdlife was beautiful and it didn’t rain before, during or after dinner. The whole night remained rain free and we managed a dry pack up the next morning which was most pleasant. Geraldton was to be our next overnight stop, we were unsure where we would be staying though. Kalbarri National Park was just near Kalbarri and we wanted to see Nature’s Window which was within the Park. This was a very busy tourist attraction to visit and it was so worth it. Beautiful and amazing place. 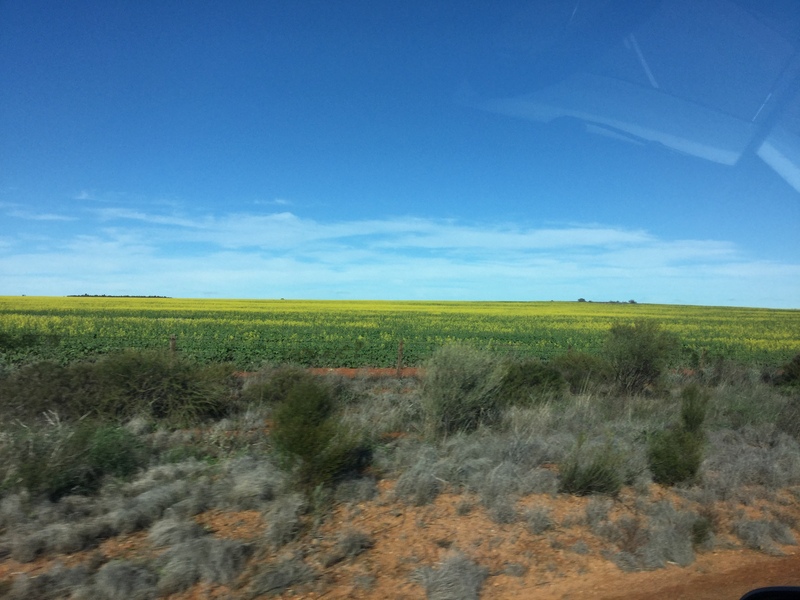 Fields were turning yellow with canola and wheat fields were dotted with emusas we headed further south, we went to the Port of Kalbarri and enjoyed our lunch overlooking the waters. The approach to Geraldton and the fields were turning gold with canola. We booked into a quaint little caravan park in Geraldton, Batavia Coast Caravan Park, it was clean and quiet. From here we headed into Geraldton to visit the HMAS Sydney 2 memorial which was absolutely brilliant. 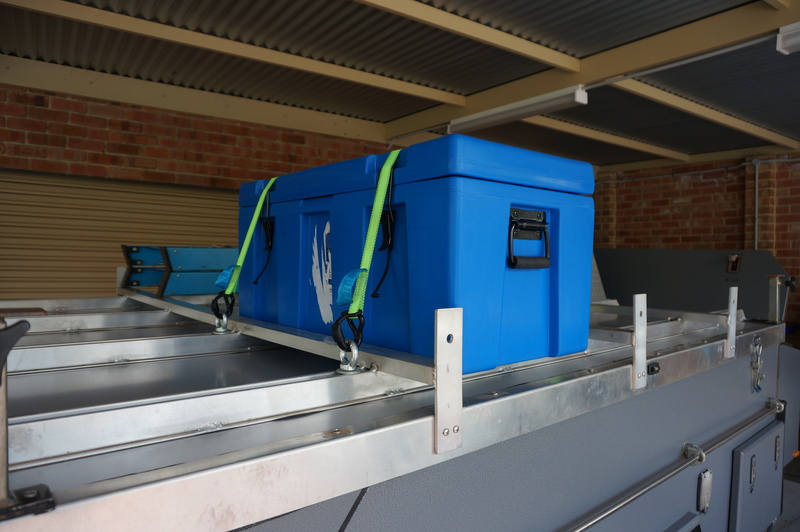 Murray also purchased his new wood box here to keep things dry for our fires and make it easier and neater to keep things on top of the trailer. The new hard case for fire wood. It was definitely a colder night here and wetter. When it was time to pack up on the morning of the 8th the heavens opened and this became our wettest pack up ever. We were drenched, it became windy as well and made folding the canvas more difficult. In the end we just got in the car and waited a while but it didn’t stop for long. Packed up and on the road we headed to Perth to dry out, warm up and catch up with our friends. 3 Responses to The Trip South Begins. Finally able to catch up with your trip. Great reading. See you soon. Sorry you have had all that rain. I am sure you will enjoy Perth with finer weather.